Hand plane names can be confusing for those new to their use. Just Google the term smooth plane and look at how many images of different kinds of planes carry that particular moniker. However, the try plane is probably the bench plane that causes more confusion and disagreement than any other in the group. Depending upon who you talk to, what part of the world they are from, or what text you are reading, this plane may be called the try plane, truing plane, long plane or jointer plane (just to name a few). So why all the confusion? In a word, marketing. I’m going to pick on Stanley for a minute, only because they are the most common of the modern hand planes. Stanley identified their line of bench planes by number, #1 through #8. They also named these planes so that users at the time would be familiar with their intended use. The problem is, that Stanley based their naming of the planes only on a particular plane’s length. Over time, the true meaning of the traditional names of those planes got lost in the marketing hype. 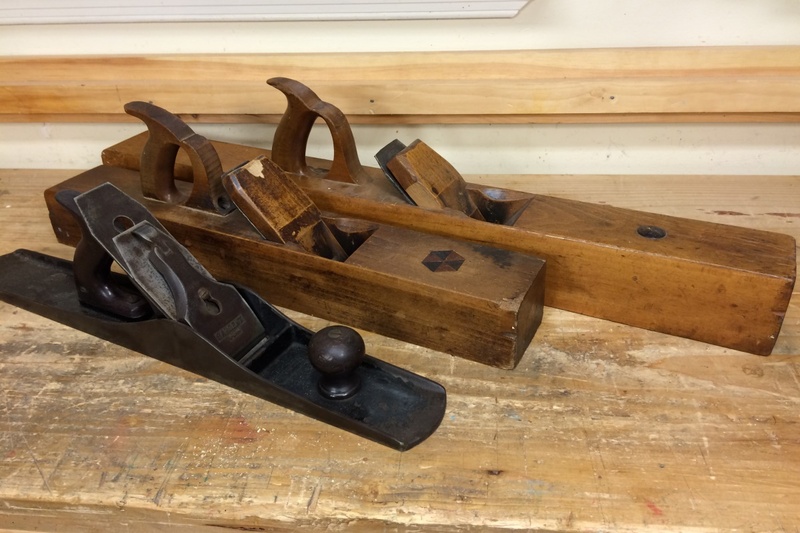 Stanley called their #7 (22″) bench plane a try plane, and they called their #8 (24″) bench plane a jointer plane. They based these names on the relative length of the plane. In all fairness, the #7 does make a very good try plane and the #8 does make a good jointer plane. However, the #7 can also make a good jointer plane and the #8 can also be a fine try plane. So you can see how confusion abounds. In order to shed some light on the subject and get to the true meaning of these terms, it helps to look a bit further back into the tool’s history. From the rear, a 30″ wooden jointer plane, a 22″ wooden try plane, and a 22″ iron try plane. So we can discern from Nicholson that the try plane has an iron ground with a convex or cambered edge to prevent the corners of the iron from entering the wood. Also, we know that the camber of the try plane’s iron is slightly less than that of the jack plane. We can also tell that it is set for a finer cut than the jack plane, and that it is used after the jack plane for flattening and straightening the stuff. From this description, it sounds like the plane is primarily intended for use on surfaces that are wider than the iron of the plane, i.e. the faces of boards. So here, Nicholson is specifically calling out working on the narrow edges of the board, especially when the intent is to make an edge to edge glue joint between two boards. This makes things a little more clear in the distinction between the try plane and jointer. Nicholson does give lengths for both of these planes as well, but as with most measurements of the period, these are generalizations and not rule. A try plane and jointer plane could potentially be the same length. The true difference in these planes is in their intended use, and therefore in their sharpening and setup. The camber on the blade of the try plane is less than that of the jack plane so that it will remove the deeper scallops left by the jack plane, and bring the surface closer to flat. As the try plane is for trying (or truing) surfaces after the jack plane, it’s iron is cambered, though less so than that of the jack plane, so that it does not leave plane tracks on the surface of the work, which is wider than the plane. The jointer plane, on the other hand, while resembling the try plane in appearance and length, is actually a joinery plane, not a surfacing plane like the try plane. It’s purpose is to straighten boards’ edges and especially to “make them join together” in an edge joint, hence the phrase jointing the edge. With this in mind, it makes more sense for a jointer plane to have a straight iron like other joinery planes (e.g. 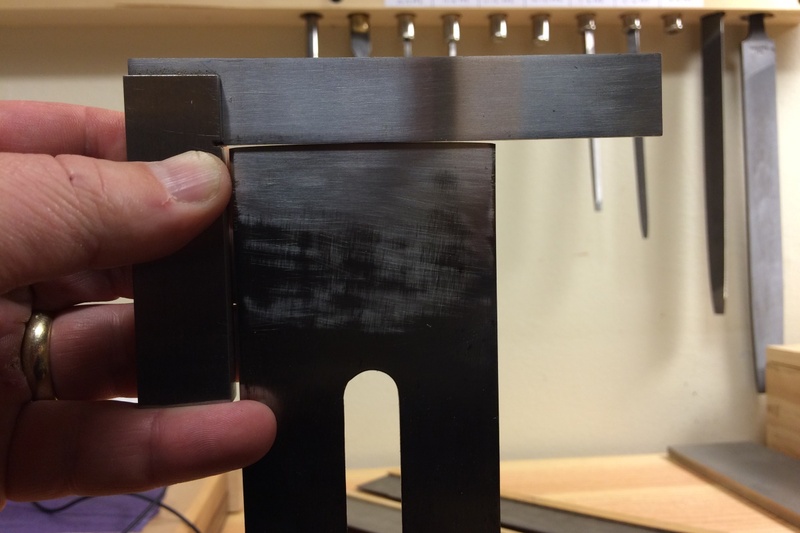 rabbet planes), because the iron of the jointer plane is wider than the edge being planed, and a straight iron will result in a flat edge, which is preferred for edge gluing. Do not, however, confuse jointing the edge with truing the edge. If an edge needs to be squared to a true 90 degrees (for example, the front of a case which will have a face frame applied), a try plane with a cambered blade will actually make the process easier. That’s because the plane can be shifted side to side to take a tapered shaving, with the thicker part of the shaving being taken from the higher corner. This process continues until the higher corner has been lowered sufficiently to make the edge square. On the other hand, when making a joint between two boards, one wants a flat edge for gluing. This is the purpose of the jointer plane. Jointed edges need not be a perfect 90 degrees if the two boards are match planed. When match planing, the show faces of the two boards to be joined are placed together and the mating edges are planed at the same time. When planed together, the boards can be opened like a book and the angles of the edges will be complimentary to each other, resulting in a flat panel. Perfect 90 degree edges are not necessary. If you don’t believe me, draw it out for yourself and see how it works. A cambered iron cannot make this joint as well as a straight iron. Hopefully, this clears up some of the confusion surrounding the try plane. You can see now that a #7 and #8 can both actually make very nice try planes or jointer planes. It all comes down to how you set up the iron. Posted in Hand Planes, Tools and tagged jointer plane, try plane.